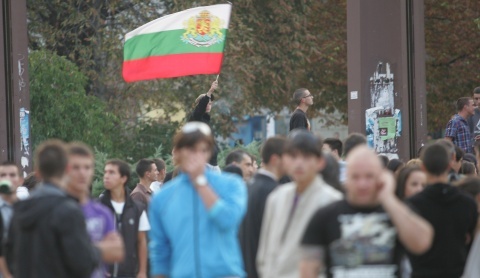 Bulgaria's capital Sofia as well as the cities of Plovdiv and Blagoevgrad saw escalating rallies Monday night protesting against the murder of 19-year-old Angel Petrov in the village of Katunitsa but also because of problems associated with Bulgaria's Roma minority. More than 1000 people, mostly youngsters rallied in Sofia Sunday night, several thousand came together in Plovdiv, and a massive rally took place in the southwestern city of Blagoevgrad as well. Protesters also came together in Pazardzhik, Veliko Tarnovo, and Varna. The new rallies, which were organized on Facebook and started at 7 pm in both cities, come after on Sunday Plovdiv nearly became the center of ethnic clashes between ethnic Bulgarians and ethnic Roma over the weekend, following the murder in the nearby village of Katunitsa of 19-year-old Angel Petrov by associates of notorious Roma boss Kiril Rashkov, aka Tsar Kiro, committed Friday night. In addition to demanding justice for the murder of 19-year-old Angel Petrov, the agenda of the protesters appears to be focusing on the "Roma issue" - or what they describe as a privileged situation of a large part of the Roma minority dealing with various crimes while enjoying a virtual immunity from prosecution and exemption from taxes. Regardless of the voicing of these grievances by protesters, suspicions remain that far-right groups and football hooligans might be involved in the rallies. "We want to declare our civic position. We don't think that all Roma are to blame. We don't want ethnic wars and tensions. We just want the Roma to know that laws are for all. We insist that they pay their taxes and enter the framework of the society," summed up the protester's position a 30-year-old man Vasil Kotsev who took part in the rally in Sofia, as cited by BGNES. "We don't accept anybody's murder – two lives were lost because of a man who thinks he is God (i.e. Roma boss Kiril Rashkov, aka Tsar Kiro – editor's note)," the protester said, adding, "The government needs to realize that there are no such gods and to remove the political cover-ups. It is wrong to set houses on fire but the people in Katunitsa were just out of their mind. Where does Tsar Kiro have all those properties from? How come we get paid BGN 300-400 per month, while others do as they please?" The police are trying to reign in the situation in Sofia as scores of youth dot the streets with nationalist chants. The situation in Plovdiv threatens to get out of hand as the rally there was more massive, with some 2000-3000 people as it kicked off. Their gathering on the Unification square is heavily guarded by the police, Plovdiv24 reported. Some of the protesters assaulted a cameraman of the bTV channel, breaking his camera, and leading him to get in a car in order to escape. The protesters are angry at bTV and especially reporter Mirolyuba Benatova claiming that she favored the ethnic Roma in her coverage of the crisis in Katunitsa. The rally in Blagoevgrad almost clashed with a rally of the local candidate for Mayor from the ruling center-right party GERB, with the participants in the protest rally shouting nationalist and xenophobic slogans.